Education is fundamental to the Quicken Trust’s work in transforming the lives of the people of Kabubbu in Uganda. The community, once devastated by poverty and disease, is hungry to learn – adults as well as children. The Adult Education programme is now giving hundreds of people a second chance. A survey by the Quicken Trust in 2004 found only 28% of adults had attended school – and only 11% completed a primary education. Quicken knows it can’t replace entirely what was missed but many are being helped to become literate and take more responsibility in their lives. Children who can’t attend school because they don’t have a sponsor and their parents can’t afford the fees, go to Saturday lessons. Many adults attend classes every week. Most lessons are based in the Community Library, which opened in 2003 with support from BA. Basic skills such as reading, writing, English and arithmetic are the most popular. 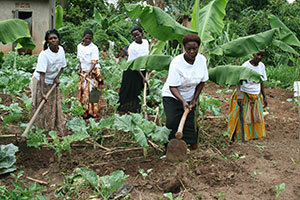 Adults can also learn more vocational skills such as agriculture and carpentry. (Agriculture; Building Projects). Age is no barrier: Remegio, who’s in his 70s, joined the adult literacy class in 2011. An annual awards ceremony recognises outstanding achievers. 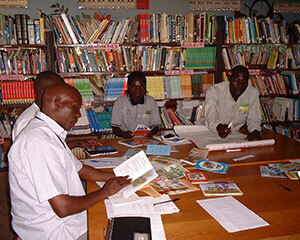 Kabubbu Community Library’s work – led by Augustine Napagi — has won international recognition. It was one of the winners of Stanbic Bank’s “Inspiration Lives in Africa” campaign which celebrated community-transforming projects in five African states. Another ‘pupil’, Mary Nakiggwe adds; “I did not know how to read or write before I joined the library literacy classes. Now I read every day.” “I have learnt many things through the library, including reading, farming and healthy living.” says Grace Nakayiwa. Learning management and leadership skills is the essential next step on Kabubbu’s journey to sustaining itself. Kabubbu’s people have been under-educated. At present, it is necessary to employ managers from outside. They are also given management training. But Quicken is also looking to train local people with potential. In time, the Trust hopes educated villagers will take leadership roles in their community.